We've bundled up 12 award-winning iOS apps and discounted each 50% to 80% off. The best part? You only buy the apps you want. Lifehacker readers can get 57% off Readdle's ever popular Calendars 5 & Scanner Pro, and 70% off Parallels Access, which brings your desktop apps (Mac & PC) to your iPad. 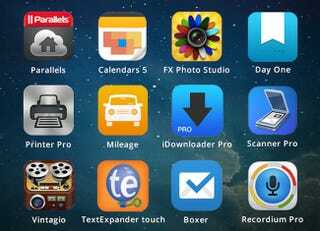 There are also big discounts on typing utility TextExpander Touch, plus six more high quality apps. In total, it's $113 worth of apps for $36 — not bad, eh? Scroll down for a closer look. Parallels Access ($49.99 – $14.99) – Provides remote access to your desktop apps. Tap, swipe, pinch and scroll any Mac or PC app. Compatible with iPad only. Calendars 5 ($6.99 – $2.99) – Beautiful calendar app that is focused on upcoming events, integrated with iOS Reminders, and features natural language input. Compatible with iPhone, iPad and iPod Touch. Day One ($4.99 – $1.99) – Award-winning journaling app. Distraction-free interface, Markdown text formatting, photographic entries, password protection and more. Compatible with iPhone, iPad and iPod Touch. Scanner Pro ($6.99 – $2.99) – Scan receipts, whiteboards, paper notes, or any multi-page document. Scanned docs can be emailed and printed, uploaded to Dropbox, Google Drive and Evernote, or simply saved on your device. Compatible with iPhone, iPad and iPod Touch. Printer Pro ($6.99 – $2.99) – Print directly to many Wi-Fi printers or any printer attached to your Mac or PC via the helper app on your computer. Compatible with iPad only. TextExpander Touch ($4.99 – $1.99) – Type faster on your iOS devices using short abbreviations that expand into long snippets, such as addresses, URLs, and standard replies. Compatible with iPhone, iPad and iPod Touch. Boxer ($5.99 – $0.99) – Connect all your emails in one place: Gmail, Exchange, Outlook, AOL, iCloud, Yahoo and IMAP. Also features swipe gestures and integration with cloud services like Dropbox, Box, and Evernote. Compatible with iPhone, iPad and iPod Touch. Mileage Log+ ($9.99 – $2.99) – Predictive input, auto-entry, auto-calculation, and quick access to frequent trips. A few quick taps later, and you have useful data that's ready to search, sort, and email. Compatible with iPhone, iPad and iPod Touch. Recordium Pro ($4.99 – $1.99) – Highlight the track while playing or recording audio, and easily attach notes, tags and pictures to your recordings. Compatible with iPhone, iPad and iPod Touch. Vintagio ($3.99 – $0.99) – Retro video styling. Includes HD filters from the 20s to 80s, authentic soundtracks, and plenty more. Compatible with iPhone, iPad and iPod Touch. FX Photo Studio (FREE) – Free photo styling app. Download it and get 3 sets of additional filters in the app for only $.99 instead of $3.99. Compatible with iPhone, iPad and iPod Touch. To get any or all of these apps, and extra info on them, check out the link below. Note: Parallels Access is only discounted through StackSocial here, you can not get it at the discounted price through the app store like the rest of the bundle.